When it comes to internet access the Smartphone has given us a gateway to the information super high way that we can't get enough of. Smartphones have changed the way we do business, socialise, find information, manage our finances, enjoy our favourite content and so much more. There are literally billions of Smartphones currently accessing the internet so why not use them to support a cryptocurrency network? This is exactly what Electroneum aims to do, by becoming a mobile-first crypto. Electroneum is the first British-developed cryptocurrency and was created and developed in 2017 by a group of people based in London, UK and led by CEO Richard Ells. In September/October 2017, the company pre-sold ETN coins to investors through an initial coin offering (ICO) in order to raise funds for further development. The Electroneum blockchain (decentralized ledger system) which is based on code from both Bitcoin and Monero went live on 1 November 2017 and put the coin into circulation. The Electroneum app wallet went live on 13 December 2017 and provides a user-friendly way of sending and receiving ETN. Why should you pay attention to Electroneum? Electroneum (ETN) is a digital money system (like Bitcoin) that was specifically designed for mobile users – thereby appealing to a potential market of 2.2 smartphone users worldwide. 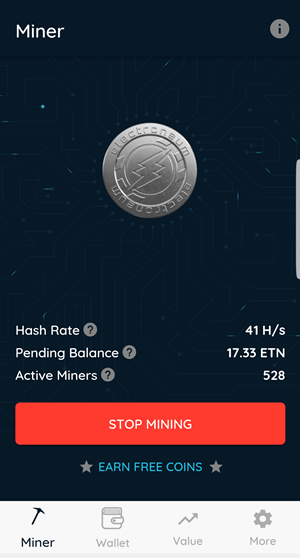 The Electroneum mobile mining experience (when available) will allow anyone to mine ETN coins with their mobile phone. Electroneum has a major advantage over other cryptocurrencies in that it can be mined using a mobile phone. Traditionally, mining could only be performed on a computer with lots of processing power. However, the team has created an algorithm that allows anyone with a mobile phone to mine effectively – thereby making it possible for millions of smartphone users around the world to learn about cryptocurrencies and mine their own coins. What is Electroneum used for? Creating a game that advertises ETN as an in-game currency could also prove to be an effective marketing tool. One mobile game currently in beta testing involves trying to fly a rocketship to the moon while collecting ETN. When the player dies, they have to watch a video advertisement to help fund the ETN rewarded to the users. As a digital currency (or cryptocurrency), Electroneum is created, held, and spent entirely electronically. No one person or entity can control it or regulate it and can be done via the mobile app wallets making it easy to pay for goods and services. Yes, Electroneum uses POW to secure its blockchain and requires decentralised support to keep the network running optimally. Electroneum uses a proof of work algorithm to secure its blockchain and therefore it can be mined. Electroneum can be mined by CPU and GPU. Electroneum is the first cryptocurrency to offer mobile mining from your Smartphone using a mobile app. It doesn't actually use the resources of your phone but creates a simulation matches what the potential of your device would be, running this on a cloud server and generating hashes to mine Electroneum at that specific rate. Once you produce enough hashes your account will be rewarded with Electroneum. Download the Electroneum mobile app (currently only available for Android, iOS to be released in 2018) and get your referral code. Ask a friend to download the app and send them your referral code or let them scan the QR code directly from your phone, once they sign up you will receive 5 Electroneum coins. A bonus giveaway is also available for those who sign up 5 referrals in a week. You will automatically be entered into a draw to win 5000 Electroneum coins. Should you invest in Electroneum? The Electroneum is a leap forward in the cryptocurrency market, making it possible for anyone with a mobile phone to participate in the network and lowering the barrier to entry. This has the potential to create viral growth and mass adoption. However, their iOS app has not yet been released and their Android mining app is still currently in beta testing for a few users and blocked for anyone new wanting to get on board. Having your primary USP faltering like this does not bode well for investor confidence.